Shri Pradeep Kumar is an Indian Railway Service of Signal Engineering (IRSSE) officer of 1981 batch and joined Northern Railway in 1983. 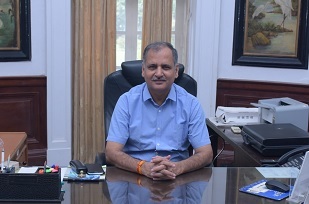 He has served on Northern Railway, South Eastern Railway, South Central Railway, West Central Railway, Railway Electrification, Railway Board and RailTel Corporation of India Limited, New Delhi. Some of the important assignments during his service including Additional General Manager,West Central Railway, Jabalpur,Chief Safety Officer, South Eastern Railway, Kolkata,Divisional Railway Manager, South Central Railway, Vijayawada, Executive Director (Signal Project) and Director (Telecommunication), Railway Board, New Delhi and General Manager (Business Development) and Executive Director in RailTel Corporation of India Limited (RailTel), New Delhi. He has traveled widely over various countries and undergone trainings in High-Speed Rail at Japan, Strategic Management at Carnegie Mellon University, Pittsburgh, USA etc. His areas of expertise include telecom network design & planning, train operations & disaster management, signaling projects managements etc.